For quite a long time, I’ve primarily been using GThumb to manage my photos. It’s fast, did approximately what I needed it to do and had this great “Apply physical transformation” checkbox on the Rotate tool. What this did, was look at the Orientation information in the photo (as recorded by some cameras) and try to automatically rotate the photo correctly. For the most part it seemed to work great. Sometimes, they didn’t display correctly in other software, and I thought that was the other software’s fault – worked fine in GThumb. However, as I’m now writing a tool that does similar things, I’m discovering that the fault was actually GThumb’s. After rotating the photo, GThumb did not update the photo’s orientation information. This caused all other applications (Eye of Gnome, Nautilus – website out of date!, etc) that correctly read this information, to display the image rotated incorrectly. In subsequent versions, a feature was added to counter this: Tools->Reset Exif Information. Applying this tool to the affected photos would solve the problem, but seeing which photos are affected is NOT intuitive. Hopefully, PhotoFile will make this easier with a clear UI. 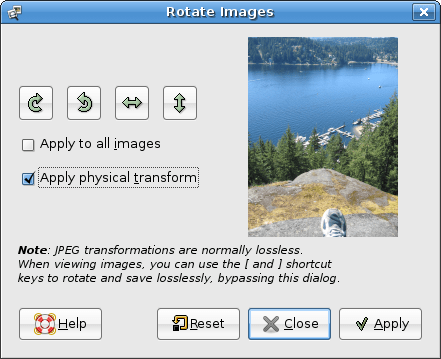 The Rotate tool in GThumb now correctly adjusts the photo’s orientation information after rotating it. Some of the discussion regarding the bug is … amusing. Posted on Friday, September 14th, 2007 at 1:01 pm. Tagged with: Gnome, Linux, Photos, screenshots.